I have participated in ICRC13, very much thrilled and exited and the challenge is 'Making a Christmas Card with NON TRADITIONAL COLORS. So i made this card with brown, black, some dark blue and light blue.. And added some glitter too. Yay.. 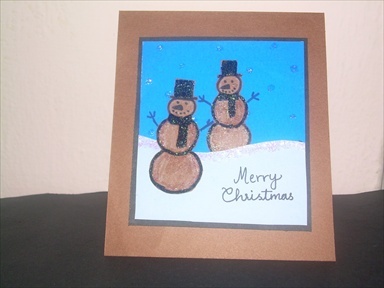 I made these simple Christmas cards with limited supplies. I used glitter pens and just to restore those glitter I covered the glittered image with a sellotape.. Hope you all liked it.. Enjoy..